A Taliban solider is captured and transported to an unknown European country for interrogation, but he managers to escape. He is pursued and is forced to resort to any means necessary to escape and survive in freezing conditions. Initially, I wondered whose side I would be taking on this. The audience knows from the start that this is not some kind of mistaken identity situation; the Taliban soldier is not an innocent man. He is seen tortured and packed onto a plane with a group of prisoners in familiar orange jumpsuits with black bags on their heads. However, as he tries to find his way to survival, it is hard for the audience to not have some strange empathy for him. It is from his point of view that we are following the journey. He is trying to survive in an unfamiliar world. 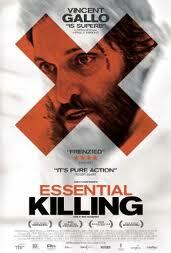 However, some of the things he does are horrific, and I wouldn’t recommend this film to anyone squeamish. I watched the film with clenched teeth and kept hoping that the 85 minutes were almost finished, but I cannot deny that it is a compelling film that I am glad I saw.